The firm warned that the number of malware variants is continuing to grow, too, and isn’t going to slow down any time soon. 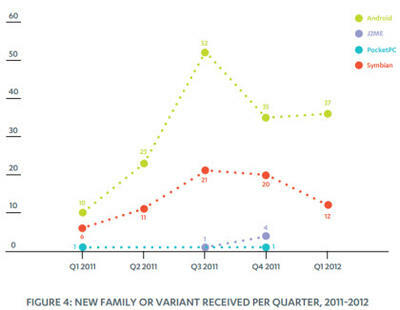 There were 10 new malware families and variants during the first quarter of 2011 and that figure jumped to 37 different variants during the first quarter of this year. “A comparison between the number of malicious Android application package files (APKs) received in Q1 2011 and in Q1 2012 reveals a more staggering find — an increase from 139 to 3063 counts,” F-Secure explained. The company said the growth is largely due to the number of malware authors that are specifically building their infected APKs to skirt around anti-virus software applications. “The most interesting malware trend over recent months has been the increase in Trojans that deliver on their promises,” F-Secure analyst Sean Sullivan said in a statement provided to Forbes. “This makes it harder for victims to know they have been victimised as there is less for them to detect.” Thankfully, most users can avoid malware by sticking to Google’s Play store instead of downloading apps from third-party marketplaces.